Kuala Lumpur, Malaysia -- When Brahma Sahampati implored the just Enlightened Buddha to teach what He had attained, the Buddha reportedly said, "This Dhamma that I have attained is deep, hard to see, hard to realize, peaceful, refined, beyond the scope of conjecture, subtle, to-be-experienced by the wise. But (with) this generation being attached, is excited by attachment, enjoys attachment ... conditionality and dependent co-arising are hard to see.... And if I were to teach the Dhamma and if others would not understand me, that would be tiresome for me, troublesome for me." Then Brahma Sahampati said to him, "Please teach... for they are those with little dusts in their eyes. They will understand your teachings" (SN 6.1). Thanks to this imploration the Buddha Dharma as we know exists till this day. While much has changed for humanity since that fateful meeting, one thing has not: Buddha's Dhamma remains "deep, hard to see, hard to realize ... beyond the scope of conjecture" for many people. Or shall we say, for many Buddhists. 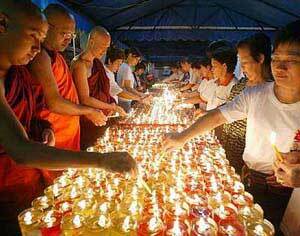 Today many will throng the temples to "celebrate" Vesak Day. It is also called Buddha Day as it commemorates the birth, the awakening and the passing away of the Buddha. When one goes to attend the special services organized by some of these temples, one sees very different things. In fact nothing like what the Buddha taught at all. In some Thai temples, it is not uncommon to see people placing their belongings - wallets, amulets, car keys, even handphones - into the alms bowl of monks. When the bowls are filled, the monks then proceed to initiate chanting in front of a kneeling, palms folded congregation in front him. For many, the chants signify some mystical sound that purports to give spiritual protection - over their health, their wealth, their loved ones and even their car. For those who know, the chanting are nothing more than homage paid to the Triple Gem, reflection of the five precepts and some protective verses. In some Mahayana temples, congregation pay up to tens - sometimes hundreds - of dollars to have their oil lamps placed at strategic locations of specially constructed altars. The more strategic the placement, the more you have to pay. Some temples even have payment requirement to have access to special chanting sessions. In fact, you must have the capacity to afford these fees, as some reaches into the realm of thousands. What all these shows is that we have missed the point of celebrating what actually Buddha Day means. The Buddha, while extraordinary, was human. He epitomizes the capacity of humans as unique amongst sentient beings - heavenly or earth bound, in terms of the higher evolution and development of our consciousness. Why do Buddha appear? A start-up tech expert was overheard saying, "Buddha is just a prototype to showcase what a fully realized human mind is capable of." Indeed the Buddha arises only in the human world, not in heavenly realms or the lower worlds. Enlightenment transcends both the earthly and the heavenly realms and attains a state that is unbounded, free from both space and time. This is Nibbana (or Nirvana), the highest release and fullest liberation. Earlier it was mentioned that Vesak, or Buddha Day marks three keys events. The first one is the birth of the Buddha. The Buddha means “the awakened one.” Inversely speaking, when Siddharta became Buddha, everyone else was "non-Buddha". This literally implies that everyone except Him, all beings - whether earthly or divine - was (and still are) in a state of “non-awake”. To be non-awake means to be still in a state of ignorance, that we are utterly unaware of the binding powers of greed and hate which grips and holds us in samsaric cycles. 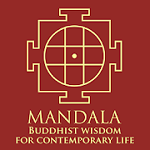 Non-buddhahood rooted in ignorance means we do not develop capacities to learn about our true nature (the mind) and to know the real state of things (the body). The second event marks Siddharta's Enlightenment. An epochal occurrence, this becoming of a Buddha tells humanity that it is possible to be free from all the bounds of samsara. It signifies our ability to rise above all worldly limitations, of identifying ourselves with the past, the future or even the present, which disappears as it comes. When the mind clears and consciousness calms, we are able to see things as they are, that all things are impermanent. Whatever exists will change and that such impermanency will not satisfy us completely. Good and bad things - all will come and go. What is impermanent and unsatisfactory has neither essence nor eternity. A significant attribution of Siddharta's Buddhahood is that His attainment was achieved through driven self-perseverance. He depended neither on a god, a teacher or existing holy books. As Buddha, He was free from association with any human class - high or low. He was free from the politics of human and religious control. He was free from the limitations of racial identities, of being citizen of a country. Indeed He was "the Knower of the worlds, the teacher of gods and men" (Lokavidû, Satthâ deva-manussânam). The take away lesson here is that if we earnestly wish to develop ourselves to the fullest, we need neither authority, wealth or birth rights to realize our dreams. Which brings us back to the question: why have the unsavory activities such as those described above in the Thai and Mahayana temples keep occurring every Vesak? Brahma Sahampati had done his job, and Buddha kept his bargain and kept teaching His Dhamma for a full 45 years. And as a result of that, realms of teachings, tips and templates for enlightenment for us lesser beings have been laid out. The path (Four Noble Truths and Eight Fold Paths) has been established and (meditational) tools and applications taught. And the Buddha said many times: I have done it and so can you. Here, I show you the way. Perhaps the Buddha knew too well. The world may have changed since that meeting with Brahma Sahampati, but not everything has. And in his words (again), He said “…but (with) this generation being attached, is excited by attachment, enjoys attachment ... conditionality and dependent co-arising are hard to see.” Replace “generation” with “Buddhists” and it becomes clear how we have got it all so wrong. 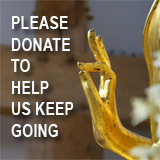 Buddhist centers which thrives on giving spiritual materialism, i.e. rituals to feed the comfort of the senses is actually guilty of drawing followers further away from the opportunity of knowing oneself. As a result, most such Buddhists are merely followers by name, or Buddhists by label. The Buddhism which is conveyed to these types of followers is usually related to symbolism of the rituals, which in many cases have meanings which are skewed from the original. As the hand-me-down info hardens to be folk knowledge, and becomes inherent values of their lives, it becomes difficult to defend when foreign beliefs question their legitimacy. This is particularly true in impoverished villagers located in mostly Theravada Buddhist countries such as Sri Lanka, Myanmar, Laos and Cambodia. These “born Buddhists” take Buddhism as a hand-me-down religion from generations before them. When Christian evangelists descend upon their villages and offer them aid such as free schooling, free food and other amenities to alleviate their poverty, their faith on Buddhism as a means of salvation is tested. Similarly, when Buddhists are faced with aggressive demands by Muslim fundamentalist (read salafi and wahabbi) for things such as segregation of schools, the use of loud speakers during muezzin and the right to slaughter animals during Muslim holy days (even when it coincides with Poya days where non-killing is practiced as required in the five precepts), local Buddhists just let them. While Muslims in general know their basic obligations, Buddhists generally are not knowledgeable of theirs (other than doing dana for merit making and sending out thoughts of loving kindness). Thus, they almost always end up on the losing side. And when things take a turn for the worse, as in the case of Myanmar, nationalistic groups – even monks themselves - behave just as badly and as cruelly as the perpetrators which they accuse of barbarity. We can assume that external circumstances may have forced Buddhists there to take more extreme measures to face these threats. But do Buddhists really need to go down to such “barbaric” levels using violence and breaking every single moral precepts along the way? Some even say that if we go by the book and follow Buddha’s spirit of ahimsa, Buddhism would be wiped out. What this goes to show is the emphatic lack of faith in using the Buddha Dhamma to empower communities to resolve issues. The current predicament also demonstrates the lack of “Buddhist togetherness” between countries and leaders. This social and political fragmentation makes Buddhist countries to be easy picking by Christian evangelists and Muslim fundamentalists. What has happened is that Buddhists have not fallen prey to external threats because of their nature to be “loving and kind” and “compassionate”, but because they have failed to be vigilant in keeping the teachings of Buddha alive in its truest sense, that is, to be awake, to be aware and fully conscious of oneself not to be lulled into the dangers of the three evil roots (ignorance, hate and greed). In founding the path of liberation, the Buddha ably demonstrated the way forward, which is: identification of problem (Four Noble Truths), identifying the path for resolution (Noble Eight Fold Path) and perseverance until attainment of goal (meditating under the Bodhi tree and fighting off all kinds of distraction). The plan is there. The tools are all ready to be used. Except that Buddhists are not using that plan and picking up the tools to be applied in their day to day life. This is the Vesak message that all Buddhists must wake up to. Together we can resolve our problems without bringing ourselves down to the lows of our adversaries. We need not be barbarians to outfight the barbarians. We are much, much better than that. Our problems – whether big or small - can be resolved, provided that we do not forsake what Buddha has bequeathed us. His Dhamma is still valid and effective. All we need to do is to practice it whole heartedly, and to be sincere with the practice. Vesak reminds us that we can empower ourselves to self-awakening, and free our own mind and heart. Let us fill this life with Vesak blessings right now and reinvigorate the Buddhist community throughout the world through His teachings.